We often talk about the effectiveness of email marketing, and for good reason. After all, no other tool available to the small business owner boasts a 4,300% return on investment, according to the Direct Marketing Association. Email automation is the practice of automatically sending a specific group of subscribers one email or a series of emails. 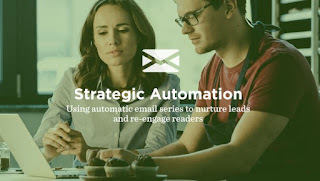 Automated email campaigns are different from one-off campaigns or newsletters in that the email or series of emails are predicated on an action the subscriber takes, or an interval of time that has passed since the previous email. Automation allows you to build trust and credibility with your subscribers (just like with individual emails) but with the added benefit of saving you time because you don’t need to create and send each campaign manually. Promotional: Keep customers in the loop on upcoming events, sales and limited-time promotions, building interest and reminding them to shop. Educational: Teach customers to use your products or services, and educate them on tips or tricks by highlighting one or two features per email. Top-of-mind: Send emails nurturing repeat business, regularly reminding customers you stand ready to serve. Re-engagement: Keep in contact with older, inactive or less frequent customers to win back their business or bring them in more often. Or remind customers about abandoned online shopping carts. Onboarding: Share information relevant to new customers, and upsell them to upgrades or additional products. Product launch: Update customers on new items or product enhancements, or build anticipation to new releases. What are the advantages of email automation? Research shows that email automation is one of the most effective forms of marketing. Open rates are 80 percent higher with an automated series than with emails sent on a single basis, according to MarTech Zone, while average click-through rates are three times higher. Similarly, companies that excel at email automation generate 80 percent more sales at 33 percent lower costs than other firms. Moreover, this level of automation provides greater insight, more quickly, into which email topics perform better with particular segments than tracking the results of solitary emails does. Automated series have a defined beginning and end, such that every new prospect is welcomed and nurtured using the same cycle of messages, instead of random addresses jumping in during the middle of your strategy. Automated series nurture relationships, credibility and trust without the need for direct human intervention. They keep your brand, product or goal at the top of people’s minds until they’re ready to commit. They’re versatile and can be used for various purposes, depending on your goals as a small business or nonprofit. Some campaigns are geared primarily toward promotion. Others focus almost entirely on education, training, re-engagement, following up on abandoned carts or promoting an event. Automated email content can include copy, graphics, photos, animation, videos and audio footage. Topics might include brand or product features, surveys, survey results, information on using products, industry news, FAQs and interviews with people relevant to the business. When combined with the latest analytics tools, automated series can gather customer insight that provides further guidance for future campaigns. To learn more about email automation and how to set it up for your own email marketing, download our free white paper, Strategic Email Automation. Our helpful email automation infographic also offers a useful, albeit whimsical, example of email automation in action.